The ARAM gallery agreed to host my first solo exhibition in September 2017 during London Design Festival. At that time I had 5 months to create the entire exhibition. This process included generating a concept for the show, creating all exhibits as well as making a publication. 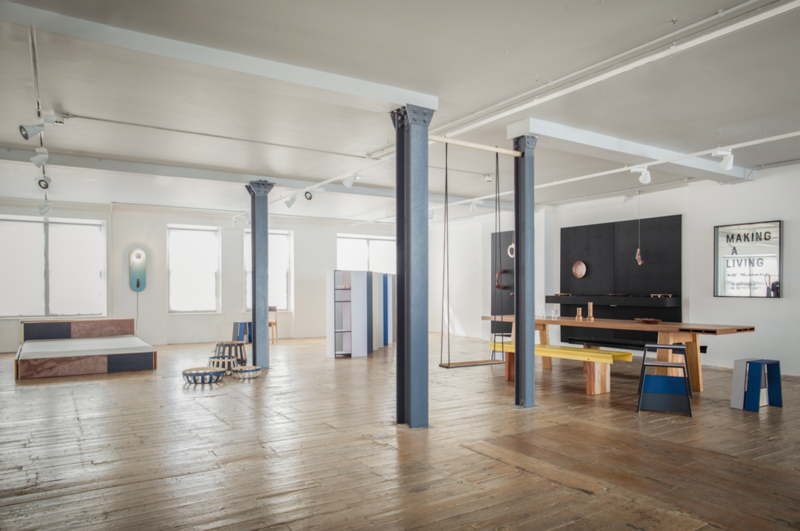 The concept of the exhibition was to present a range of new products for an experimental, ‘open plan’ living space. The space itself was ‘zoned’ into areas relating to domestic activities such as: playing, resting, dressing and hosting. I intended to design new work for this purpose. New products had to be designed relating to each domestic activity. Every object for the show had to be new and made by myself. The title of the exhibition was ‘Making A Living’. Overall, the show consisted of two bodies of work produced in two locations: my East London studio and my family’s workshop in Inverness, California. In London, I tried to refine my additive design process and assembled a series of products that employ new construction techniques and materials. Almost all pieces were furniture which was in keeping with the concept to create a ‘living space’ resembling an open plan apartment. All objects were designed in a way that they can be remade, either on commission basis though private clients or potentially being produced by a furniture manufacturer. In California, I challenged himself to make a wooden object a day for one month. Using local materials and four tools, I carved a collection of surprising pieces that are the result of an intuitive approach to making. I applied a subtractive approach to this body of work which means for one month I would start with a chunk of material in the morning and had to complete the object by the evening. I was mainly interested in the collective body of work rather than the individual pieces themselves. It was my intention NOT to think about the function of the outcome which stands in stark contrast to my approach of making and designing in London. ‘Making a Living’ brought together both sets of work, including almost 30 new handmade objects ranging from designs for production to one-offs. Part of the final exhibition: ‘Making A Living’ at the ARAM Gallery, September 2017. The exhibition was very well received during London Design Festival and was very popular equally with students, industry professionals as well as press representatives. As a result of committing to the exhibition new opportunities for me as a designer came up. Individual pieces have been sold to private clients. Other pieces have made it into other group shows. The interesting bit about the invitation to participate in this show is that I extended this body of work, particularly for this show. In a way, it really has driven my practice into a more craft-based direction. Several other pieces of the ‘American body of work’ will be presented at another Gallery in San Francisco called DZINE. It is another group show and my work will be shown there next to other Artists. This is interesting since the wood carvings are perceived as Art in this particular show. I never really considered myself an artist, more a designer, but interestingly this particular body of work seems to be bridging both worlds. Additionally, I am working with another American gallery to try and make the entire ‘Making A Living’ exhibition travel to California in order to bring it closer to a different audience. Overall, having had the opportunity to commit to this solo show created numerous avenues for my practice to explore. It was a great platform for me to show off my work and skills but equally important allowed me to branch off into a new territory with my work. All outcomes which were part of the exhibition are really only starting points of longer projects which will develop further in the future. Without the financial support of the Arts Foundation none of these opportunities would have been possible. I am very grateful for the Arts Foundation’s support. It developed my career as a designer further and at the same time pushed my design practice into unforeseen directions. I can’ t ever be thankful enough for the support. Many thanks.